Gardening can be one of those incredibly tricky things to get right. With so much to do and so little time to do it in, it is no wonder that so many people turn to professional help in order to make sure that their lawn care is in the best hands. One of the very best services is offered by gardening experts is the garden design which is available for people wondering what to do with their open space. With the right help, gardening professionals such as Handy Gardeners can make sure that your lawn is always looking at its absolute best. So call 020 3744 0111 now to find out more. Who benefits the most from the best designers helping out with landscaping? It might be that you have moved to a new home or that you have just renovated a current one. 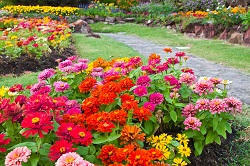 Either way, this could be the perfect chance to start fresh with the help of the right garden design services. Designing a garden can be really tough without the right kind of knowledge. If you are planning a brand new design then having the right expertise can make sure that you are getting the right kind of balance, growth and natural beauty in your own back yard. No matter the size of your garden or what you would like to accomplish, those who are new to gardening can find that they benefit from help of the right professionals. Many people have gardens which they simply do not feel are making the best use of the space. It could be that the lawn maintenance has fallen by the edge or that the leaf control has gotten slightly out of hand. If this is the case, then it can be a great idea to bring in professionals to help you add a bit of life back into your garden. With the help of a professional, you can make sure that even the oldest and most difficult spaces are transformed into something pleasant and enjoyable. Big or small, overgrown or underdeveloped: any garden can benefit from an expert eye. If you are thinking of a outdoor renovation, find out how much you and your garden can benefit from the help of an professional approach. But what is it that sets professional gardening design apart from those who try and take on the jobs themselves? Whether it is garden spraying, hedge trimming and pruning, weed control or patio cleaning, having the right skill provides a great inside when thinking about how to make the most of the garden and the space you have available. Whatever you are want to achieve with your garden, discover how much of an advantage it can be to hire in professional by calling Handy Gardeners on 020 3744 0111 now. We always aim to help you gain a clear understanding of how you want to use your garden and what materials will suit your needs best. Flexible dates, times and payment method. We deliver our service 7 days a week with no extra charge. Bookings can be made at any time and no deposits are required. We even operate on bank holidays with no extra charge.